Polydactyl cats, thumb cats, mitten cats, Hemingway cats, Cardi cats. We’re talking about cats with extra toes, and they have many names. The origin of the word “polydactyl” is Greek: “poly” means many or multiple and “dactyl” means digits or fingers and toes. Curious about these many-toed felines? Read on for four interesting facts about them. Stay with us below as we feature two adoptable, digitally-enhanced cats right here in Raleigh who are waiting patiently with our friends at Purr Partners cat rescue for their purrfect forever homes! You’re going to love them. Cats with extra toes have them because of a genetic mutation that often results in a dominant gene being shared down a family tree. If one parent is polydactyl, odds are good that at least some of their children will also be polydactyl. This is fairly common, and the reason for the famous “Hemingway cats” being so frequently associated with the mutation. Ernest Hemingway was a cat lover whose cat had extra toes. She had kittens with extra toes, then they had kittens with extra toes. So now, the many-toed offspring of that family line still live today at the Hemingway Museum and are a tourist attraction in their own right. Long ago, many sailors believed polydactyl cats brought good luck! Ships often traveled with a cat on board to catch stowaway mice, anyway. A lucky cat was even better! It is thought that this is why there are many old port cities that even now have much higher than average populations of these kitties. Generally, the east coast of North America and western England and Wales are known to have many digitally gifted cats. 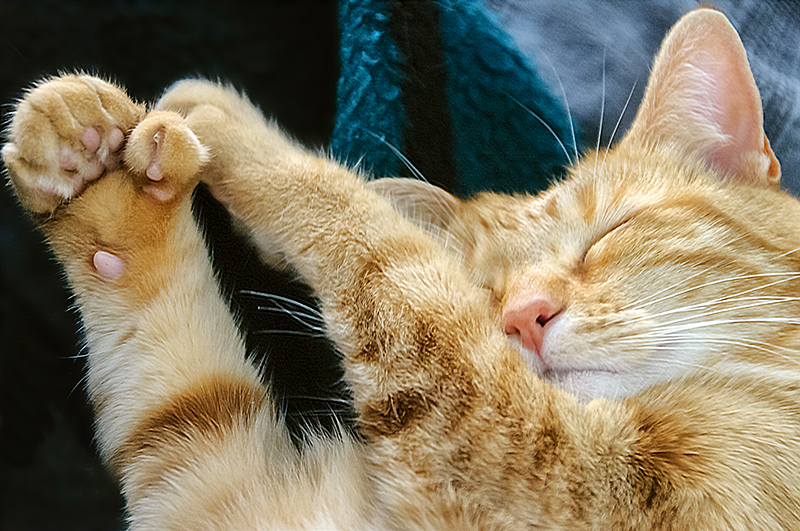 Most cats have their extra toes on the inside of their front paws, hence the reference to them resembling thumbs or making their paws look like mittens. But far less often, the toes may appear on the back paws or both! There are a couple of world-record holding cats with 28 toes because they have them on both feet! Generally, the worst thing for a cat about having extra toes is having extra claws to trim if needed. Occasionally, some of these kitties might have recurring issues with particular claws tending to be ingrown if not managed well, so it’s a good idea to keep a eye out for this if you adopt a polydactyl furry family member. 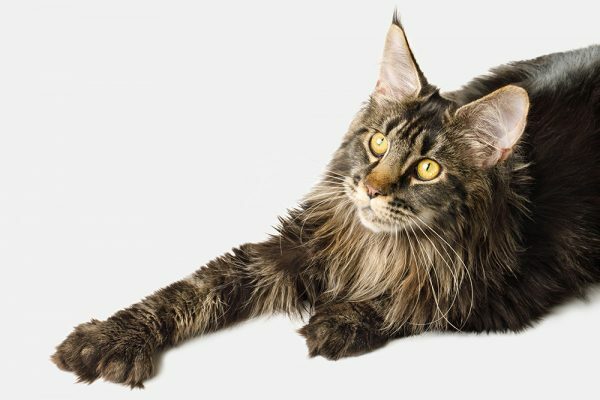 There is a condition often confused with common polydactylism known as feline radial hypoplasia, but it is genetically different. In addition to more toes, this condition can cause twisted forelimbs and pain. Fortunately, it’s rare. Raleigh cat rescue has polydactyl cats for adoption! 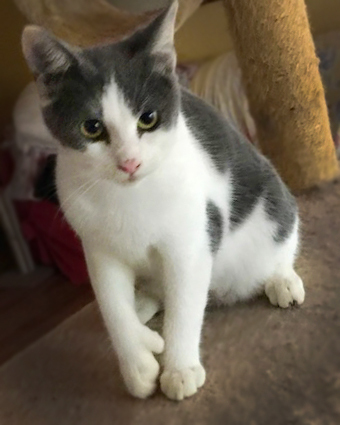 Purr Partners has two polydactyl cats available for adoption! Contact them to adopt or please share this to help them find their forever families. Ernie is a polydactyl kitten looking for the purrfect forever home. Meet Ernie! Born in May 2018, he came to rescue because someone dumped him at a landfill. Fortunately, he was found by a caretaker of the local feral cat colony there. Ernie is an awesome little boy with super big feet and thumbs and loves to gently pat your face with them! While his thumbs are very cool, the best thing about Ernie is his super personality. He is playful and entertaining, but he is also very much a cuddler and a lap kitty. When you sit down, he’s there. He’s all about snuggling and being close…really close…to you. However, he’s still a kitten, so he has lots of energy, and he adores toys and running and romping. He loves his foster playmates, and there’s nothing better than a good game of chase. He is wonderful with all cats, and people, he meets. Could you be Ernie’s purrfect match? Nicole has big, beautiful eyes and extra special thumbs! She’s available for adoption. Meet Nicole! Born June 2016, she’s a beautiful, affectionate girl who is also blessed in the thumb department. She loves to play and snuggle and is happy to be your lap cat. Nicole has very firm beliefs, and one of them is that she shall be the one-and-only princess in the household, and any other felines shall be jumped upon and bullied into submission. Therefore, we do not recommend an adoption to a home with another cat (that is, of course, unless you really don’t like your other cat). She also tends to sound stuffy a lot. Her vet says that her “stuffiness” is due to an issue when she was a kitten and will remain with her for the rest of her life, but it does not bother this brave girl at all. So, really, as long as she’s allowed to be someone’s princess, she has no issues and will make someone very happy with their new furry family member.